I remember seeing the movie a long time ago. I remember it featured Nicholas Cage and Penelope Cruz. But it was a long time ago, that when I saw this book in a second-hand bookstore in Boston, I did not hesitate to pick it up, given that I haven't read a historical novel in a while, and on top of that, it was also just 6 USD. And I have to say, it was definitely worth it. This is a historical novel about the island of Cephalonia in Greece, during and after World War II, focusing on the lives of Doctor Iannis, his daughter Pelagia, and an Italian captain Antonio Corelli, who came to the island because Italy invaded Greece. The novel covers decades of narrative time, from the time the war was slowly creeping into Greece, until the time when Pelagia was already an old woman. The novel begins with Doctor Iannis (who isn't a licensed doctor in any case) treating the various citizens of the small village, showing how life in the village proceeds. Pelagia is his beautiful daughter, who captures the attention of Mandras, a fisherman, who is charming, yet apparently illiterate. They get engaged, yet the war happens, and Mandras joins the army and heads to Albania. 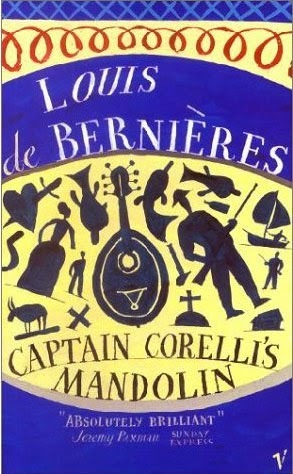 In the meantime, Italian forces invade the island, and Pelagia gets to know Captain Corelli. They in turn start falling in love with each other, but the war takes its toll on everyone. Time passes, and there isn't a happy ending in sight, at least in the short term. Years pass, generations grow up and grow old, and enduring love gets its stage. See, at first, I thought I hated this book. It was an old-fashioned love story, or so it seemed. But later on, I found myself actually liking things, even to the point of getting my heart wretched by the tragic events portrayed by the narrative. This book is also about love, in all its different manifestations. The love between Pelagia and Mandras is the fleeting type of love, the one that is fired by hormones and lust. They get to know each other very briefly, and only have desire for each other because they have raging hormones. The love between Pelagia and Corelli on the other hand is a deeper and stronger bond, honed by a more prolonged exposure, something that can endure even after years and years of absence. In the book, Doctor Iannis describes this type of love as "what remains when the passion is all gone", which is a sound definition in my opinion. Finally, love as exhibited by Carlo is one in which he was willing to die in order to save someone else, someone who he loved the most. How sad. Aside from love, the book tackles totalitarianism, in many of its forms. The novel is critical of Fascism, Nazism, and Communism, and never paints the characters believing these ideologies in a good light. In my opinion, the novel takes a pragmatic anti-ideological stance on everything: there are heroes and villains in the war, yet every hero seems to have skeletons in the closet, and every villain also seems to have a human side. As with life, the opposition between good and evil isn't aeons apart, and most heroes, while good, also have bad aspects, and most villains, while bad, also have a good side to them. In my opinion, this is a very realistic take on nature's opposing forces. Overall, I loved this book. Even though it wasn't the most original novel in my opinion, and even though it was the my favorite genre of a novel, I still found myself liking this, to the point that I was almost in tears when reading some of the passages. This one is definitely recommended, and please, if you haven't seen the movie, don't even bother. The book is way better than the movie after all. I give this book 5 out of 5 stars.